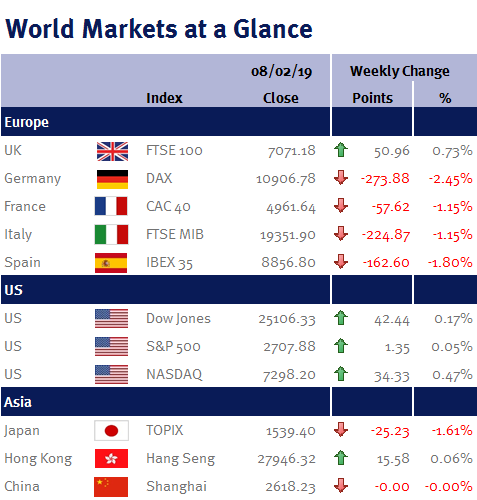 It has been a bit of an uneventful week as a number of markets in Asia have been closed for various days due to Lunar New Year celebrations (China’s markets were closed all week). However, to be honest it has been a bit of a relief given the volatility of the last couple of months due to rising US interest rates, the US government shutdown, trade war concerns, Brexit and French unrest. Even Donald Trump’s State of the Union address on Tuesday (5 February 2019) didn’t move markets one bit (although he didn’t say anything new). And while his speech no doubt made the Republicans happy, it didn’t close any of the political divide with the Democrats. For example, while he focused on his border wall, saying he will build it, he didn’t say how he would fund it – nor did he offer any incentives to Democrats to break the funding deadlock. Consequently, unless the Democrats suddenly concede to Donald Trump’s demand for $5.7 billion to continue the wall’s construction, I think it will be inevitable that the US government will partially shut down again when the stopgap spending bill expires next Friday (15 February 2019). Additionally, yesterday (Thursday 7 February 2019), Donald Trump stated that he probably wouldn’t meet his Chinese counterpart, Xi Jinping before the 1 March 2019 deadline to avert new US tariffs on Chinese goods. While disappointing, I don’t think it should be taken too negatively. Firstly, logistically it is probably difficult given Donald Trump is meeting North Korea’s Kim Jong Un at the end of February; and secondly, it is likely that the 1 March 2019 deadline will be extended given their recent talks have shown solid progress. As such, we have started to slightly reduce cash levels in the ‘Growth’ portfolios and increase Asian and Emerging Market exposure. Elsewhere, as expected, the BoE left UK interest rates unchanged at 0.75% given Brexit uncertainty. Also as expected, the BoE lowered its growth projections for 2019 to 1.2% from 1.7%. The BoE also suggested that just one more interest increase is needed in the next three years to keep inflation close to their 2% target. Personally, I think these BoE forecasts are completely pointless. It is just seven weeks until we leave the EU on Friday 29 March 2019 and we still don’t know if we have a deal or not, or whether Article 50 will be extended. I also believe there is a risk that the BoE will increase UK interest rates due to their obvious underlying hawkish bias if we have a soft-Brexit or a no-Brexit – which in my opinion would be a policy error given household debt levels. And while the BoE has also indicated that they may increase interest rates in the event of a no-deal Brexit to support the pound, I really can’t see that happening. I can remember ‘Black Wednesday’ on 16 September 1992, when the government increased UK interest rates (the BoE wasn’t independent then) at first to 12% from 10%, and then again later in the day to 15% in an attempt to support the pound. The move failed and John Major (the then Prime Minster) was forced to withdraw from the ERM (the European Exchange Rate Mechanism – which was the forerunner to the single currency). As such, I believe that in the event of a no-deal Brexit, the pound will fall irrespective of whether or not the BoE increases interest rates – it didn’t work in 1992, so why would it in 2019? Furthermore, increasing interest rates would be the exact opposite of what the BoE did at the time of the EU Referendum in 2016, when they cut interest rates to offset the shock of the referendum result and help stimulate the economy. Looking ahead, we have a much more interesting week to look forward to. In the UK and US we have CPI, PPI and retail sales data, as well as Q4 GDP data for the UK, US and eurozone.